La Palma is a small island in the northwest of the Canary Islands and is also known as La Isla Bonita. It is supposed to be the most beautiful island of the Canaries, so I was especially looking forward to this stop. For this day, TUI Cruises offered excursions to the national park, to the vineyards or to the volcano of San Antonio. However, since it heard that we should have bad weather on La Palma, I decided against an excursion. 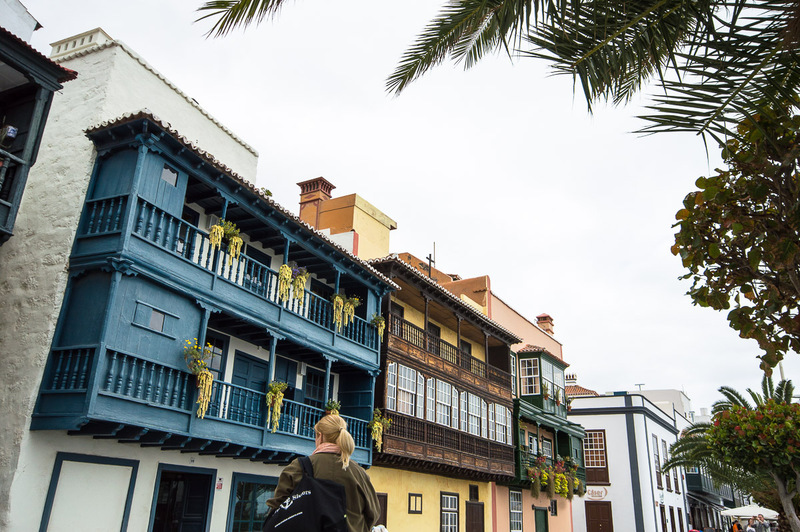 I wanted to explore the capital of Santa Cruz de La Palma on my own. 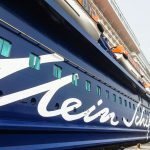 How to get from the ship to the capital Santa Cruz de La Palma? 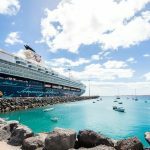 At La Palma, cruisers have a great starting point for excursions to the island. 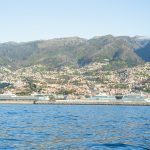 The cruise terminal is right next to the city of Santa Cruz de La Palma. A free shuttle bus runs from the ship to the port exit. The bus trip takes only 2 minutes and you have already arrived. After getting out of the bus, go to a roundabout. To the left you will see a little port and McDonald’s, to the right is a car rental in the direction of the city. After a few meters you will see a second small roundabout. There is a tourist information. Here you can get brochures, bus timetables and a city map. Here you go left and walk for another 2 minutes and you are already in the pedestrian zone, the Calle O’Daly. The Calle O’Daly is the main shopping street and runs parallel to the port and Avenida Maritima. Previously, it was called Calle Real (royal road). This is why you will see wonderful mansions on this street, some of which still date back to the 17th century, as well as old palaces of the city. 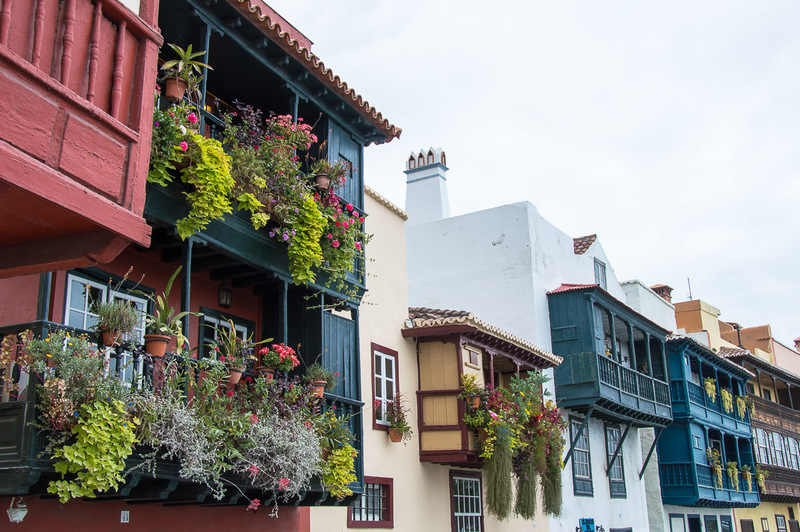 The houses are partially decorated with elaborate windows and decorative balconies in the Canarian style. A beautiful sight to get a first impression of the flair of the city. You can also admire the beautiful balconies in Avenida Maritima, but you will find more details later on. The streets of Santa Cruz de la Palma are small and mostly cobbled. So you better don’t wear highheels for the city walk. To the left and right you can see white and colorful houses with many small balconies. There are many lovely shops in these houses. It is wonderful to stroll through these alleys, while discovering the old town. You should definitely have a look into the small shops. Often these shops were surprisingly large, as the houses reach far back. Sometimes even an inner courtyard was hidden behind an entrance. The view behind the facades is worth it. In the various courtyards I discovered not only charming small shops, but also small cafés and bars. Just before I stopped in a café, I passed the Iglesia Matriz de El Salvador. 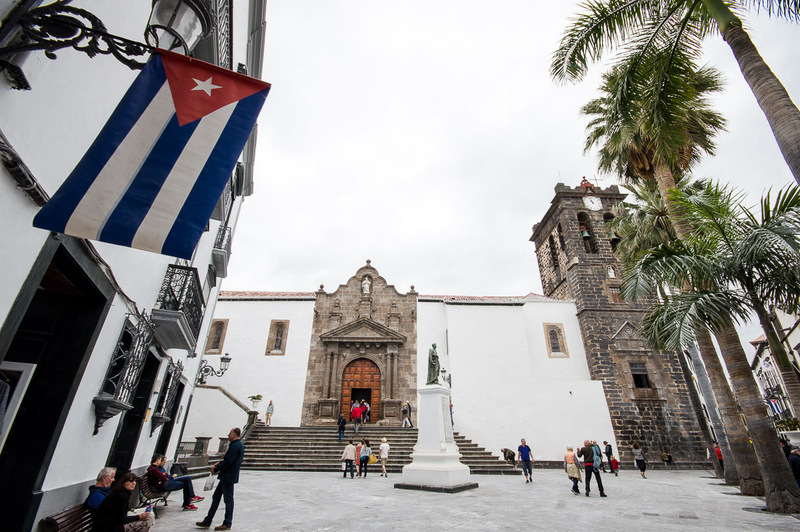 The church is located in Plaza España and dates back to the 15th century. 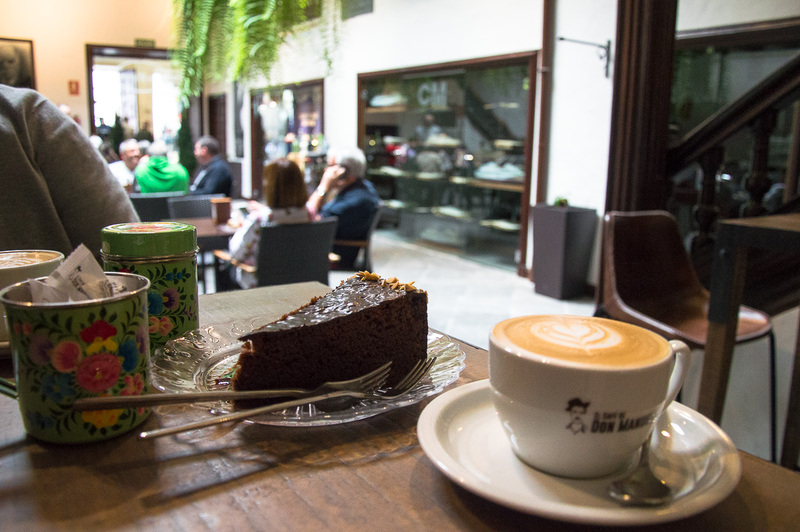 A cafe I particularly liked was the El Cafe de Don Manuel on Calle Anselmo Perez de Brito N 2. Just a catwalk from Plaza España, on the right, you can see the number 2 over the open passage. The entrance to the café is behind a wooden door above which you can see the number 30. Once you have passed, you enter a lovely, planted courtyard, where the El Café de Don Manuel is located in. The owner of this café has even been awarded a barista, so you should try a delicious coffee. And try a piece of his fantastic cake. I drank a café con leche and tried an almond chocolate cake. Both were a delight and also quite affordable. My tip: If you like coffee, you can buy somecoffee beans for your friends and family in this café. 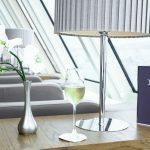 That way you can enjoy the canary island flair back home. 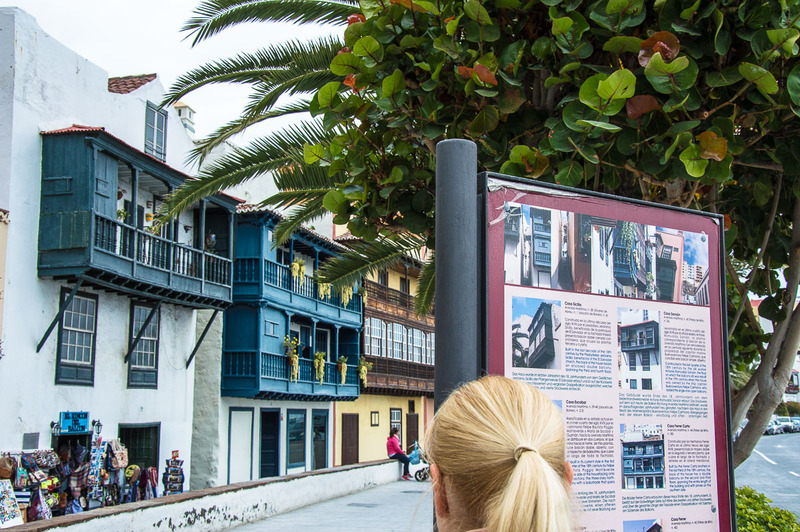 The highlight of Santa Cruz de La Palma, that you can find in any guide, are the beautiful balconies in the Av. Marítima. 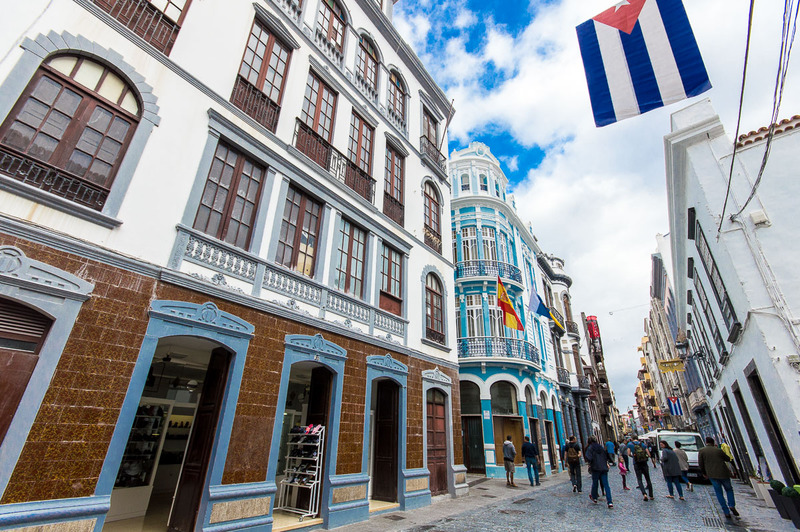 If you have not seen the balconies on Calle O’Daly, then you will definitely be able to admire many balconies in the Avenida Maritima. The path from the pedestrian zone to the famous balconies is signposted and easy to find. The Avenida Maritima is located directly at the port and runs parallel to the pedestrian zone. Most of the houses there date back to the 18th century. In the Av. Maritima 42, there are panels with explanations on which you can read some exciting information about each individual house including who lived in the house. The inscriptions of the panels are in Spanish, English and German. 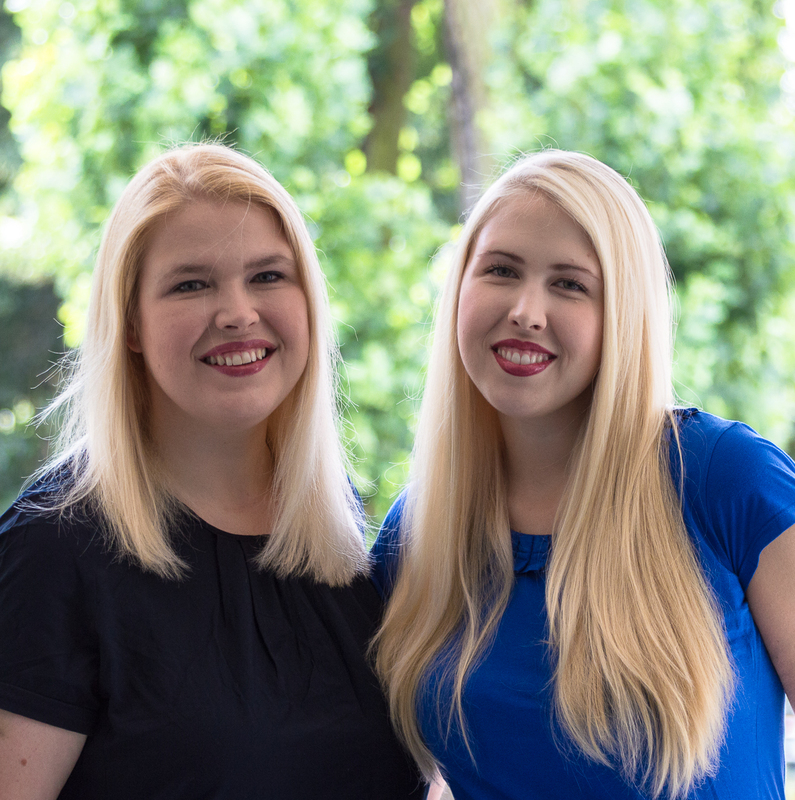 Besonders toll sehen die Balkone aus, wenn bunte Blumenkästen sie schmücken. Man fühlt sich wie in eine andere Zeit versetzt. 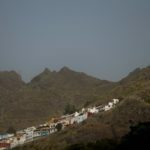 Dieses Stück Uferstraße mit den hübschen alten Häusern ist ein echtes Must-See in Santa Cruz de La Palma. 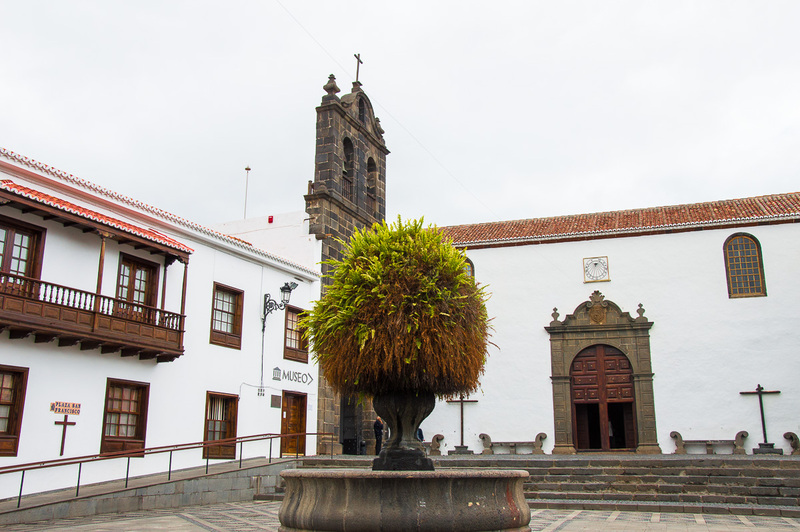 In Santa Cruz de La Palma there are several museums, such as a museum on the history of the island. 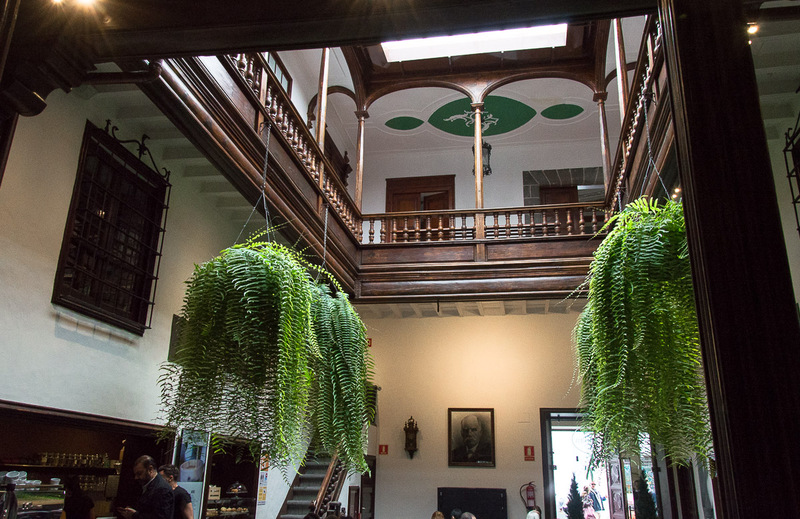 The Museo Insular is the largest museum in Santa Cruz de la Palma and is located on Plaza de San Francisco in a wonderfully restored Franciscan monastery. 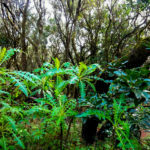 There you can learn a lot of interesting things about local knowledge, archeology, art and nature on La Palma. Admission costs 4 euros per person. Children (up to the age of 18), seniors (over 65 years), the unemployed, student groups, journalists and the disabled have free admission. The opening hours are from 10 am to 8 pm from Monday to Saturday and from 10 am to 2 pm on Sundays. I was particularly impressed and almost magically attracted by the Museo Naval, the shipping museum. 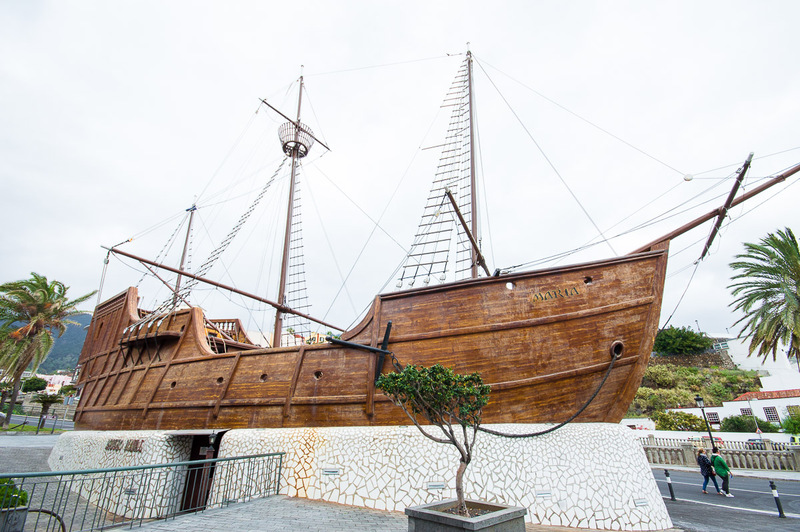 The museum is located in the original size of the replicated “Santa Maria” by Christopher Columbus at the Plaza de la Alameda. In the hull of the ship is the museum about the history of the sea voyage. There were old sea charts, navigational instruments and parchments of the Court for Spanish America. A small spiral staircase leads to the upper deck. There were three other small exhibition rooms including a video-tour. The feeling to stand aboard the Santa Maria was fantastic. I can recommend this museum not only for children, but also for adults. You can feel the history on this ship. Admission for children is free. Families pay 4 euros for up to four people and adults pay 4.50 euros entrance. A really fair price for this experience. In Santa Cruz de La Palma there is a wonderful market hall. As you already know, I love market halls. This market hall is really small and has only about a dozen stands. At these stands you could not only buy flowers and fresh fruits, but also honey, pastries, sauces and all sorts of other culinary treats. 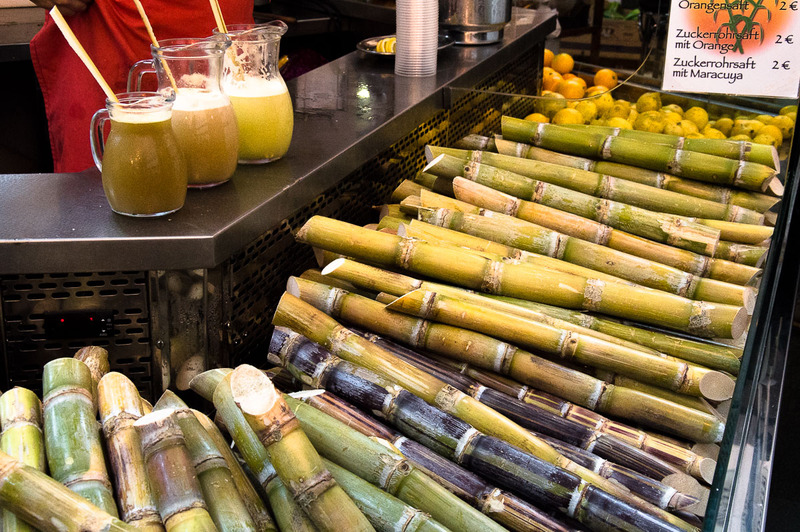 At one market stand they had something very special to drink, which reminded me of Cuba: sugar cane juice. 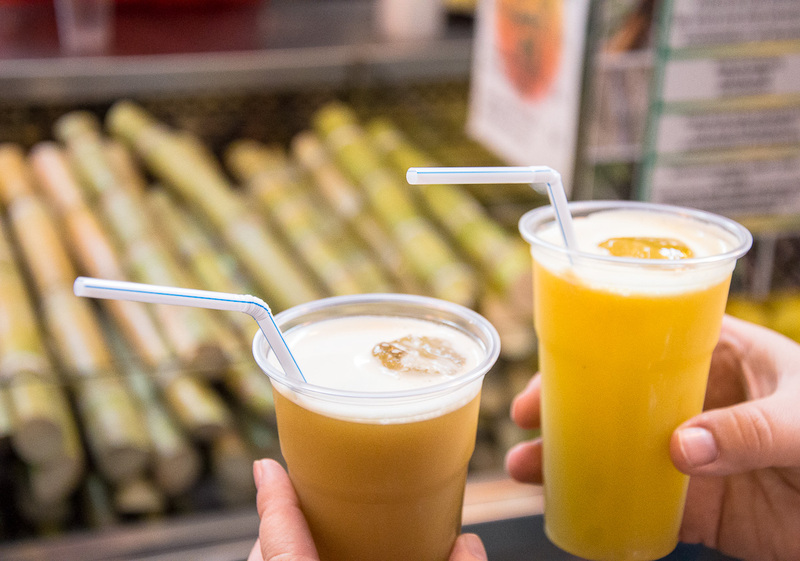 They offered sugar cane juice in different variations. For example pure juice, mixed with orange juice or with maracuja juice. The juice was prepared at the stand and cost 2 euros per glass. The cane juice was delightfully refreshing. I would say: you have to try it! Around the market there were other small bars, where you could see many locals as well as tourists eating tapas and drinking wine. The market hall is therefore a great place to stay and try some culinary delights. 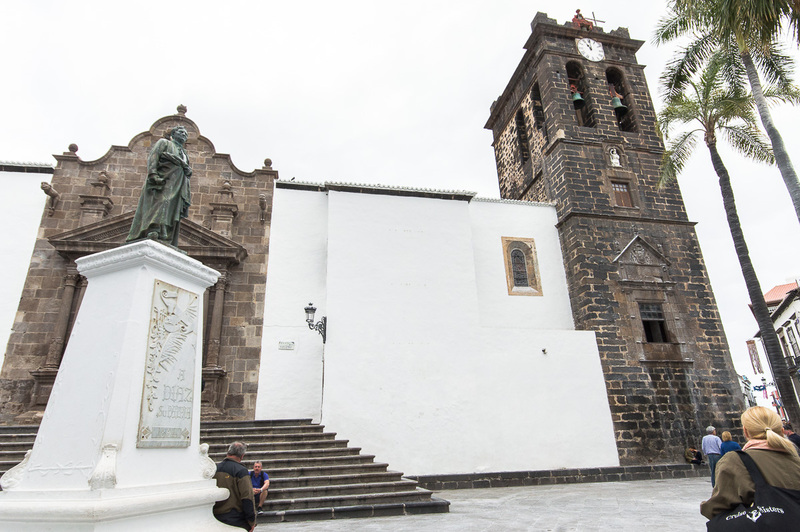 Santa Cruz de La Palma was easy to explore on foot, because the ways are short and many sights are easy to discover. Linguistically, there are hardly any barriers, because in front of the sights are mostly explanations in Spanish, English and German. So you could learn more about the buildings, churches and monuments without a tourist guide. 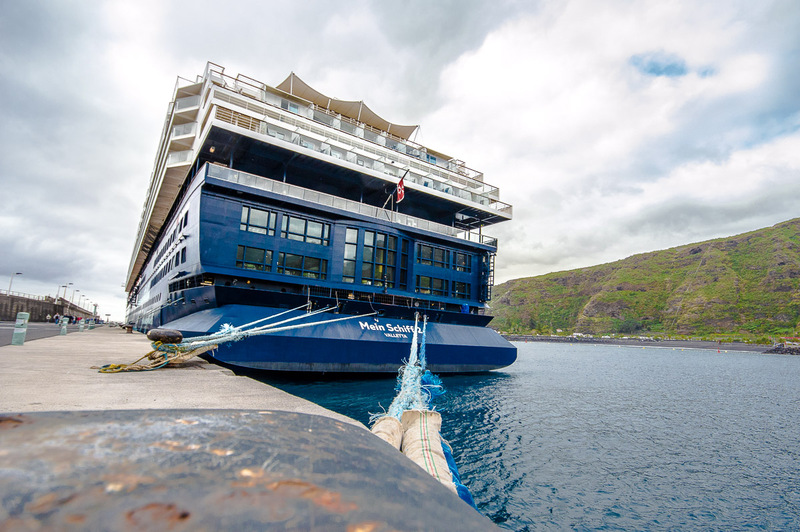 I would always plan a few hours for a little stroll through Santa Cruz de La Palma at this cruise port. Next time, we will explore the rest of the Isla Bonita.